So we decided for a few days off, but where to do for a week? Too short to fly anywhere exotic, but beach was on the agenda, so we decided on the island of Ruegen, located on the north-east coast of Germany in the Baltic Sea. Getting to the island was a 900km drive, and to be honest, it is a bit “out of the way”. The “Around Me” app that tells you all the things worth seeing in your immediate vicinity beeped and helpfully informed me the closest Apple store was 689kms away. However, the island was lovely and not as desolate as we first expected. The tree lined lanes, which almost formed a tunnel, were picturesque, but I imagine could be deathtraps if you swerve more than a few degrees off true. We left these behind and in our first town we did see some shops, the local steam train and signs for all manner of touristic crap. We drove through and arrived at our hotel in the delightful city of Goehren which was hosting a music festival. Hungry, we decided to try the fish the island is famous for. The scampi we chose fresh of the barbecue looked lovely, but it was half cooked and tasted of lighter fuel – we went for the traditional German sausage after that. The hotel was lovely with beach chairs, pool and a great restaurant – which we only discovered post sausage. We hired bikes on the first day and cycled down to the southern most point of the island and stopped off to sun bathe on the way back. The beaches were lovely, warm sand, gently sloping to lapping waves (although the water was tepid to say the least). Now, being British, I am used to the rigmarole and procedures of being a on a beach. The farce of getting the deck chair up and the towel wrap to protect from prying eyes whilst trying extract the underwear and get the swimming stuff on. 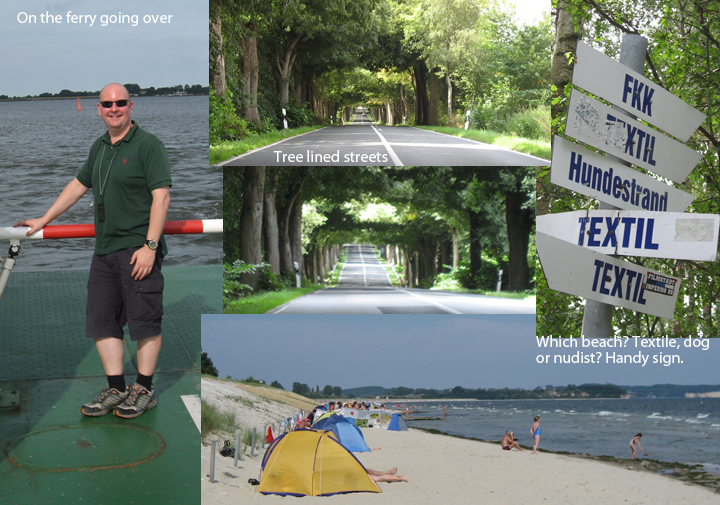 These beaches had a different class of people – the FKK brigade (aka free bodily culture aka nudists). As we sat our newly arrived neighbors simply stripped off and with everything hanging out plunged in to the water, returning wet, with everything still hanging out. I sort of lost my appetite for a while and thought back to my sausage. The other thing that Ruegen is famous for are Nazis. 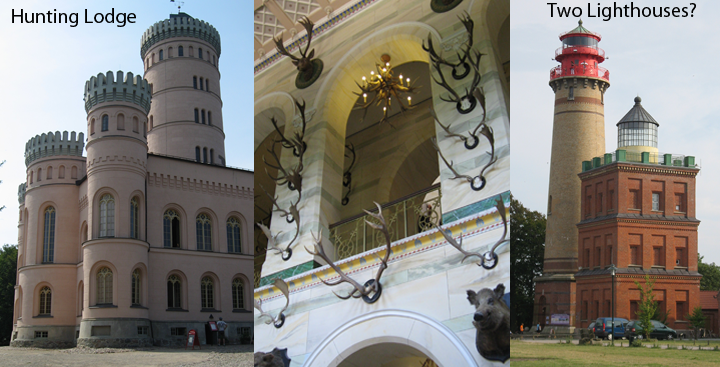 As the beaches are spectacular and the Graf of Ruegen was seriously in debt to the Nazis – so a deal was closed – a vast swathe of land was purloined to be house the first part of the “Kraft durch Freude” (strength through joy) initiative. The idea was to control every aspect of party-faithful lives and this included their holidays – so a Butlins-type campus was planned and partially erected. The magnitude of the construction is breathtaking. The brief was for a not too tall (less than 5 stories high) resort that could house 20,000 people all with a guaranteed a sea-view and (secretly) could be converted to a military hospital at a moment’s notice. Every detailed of a trip was panned. Arriving you were assigned a number which was your room, assigned beach chair (no arguments and getting up at 6:00 to put a towel down), lounger and restaurant seat. 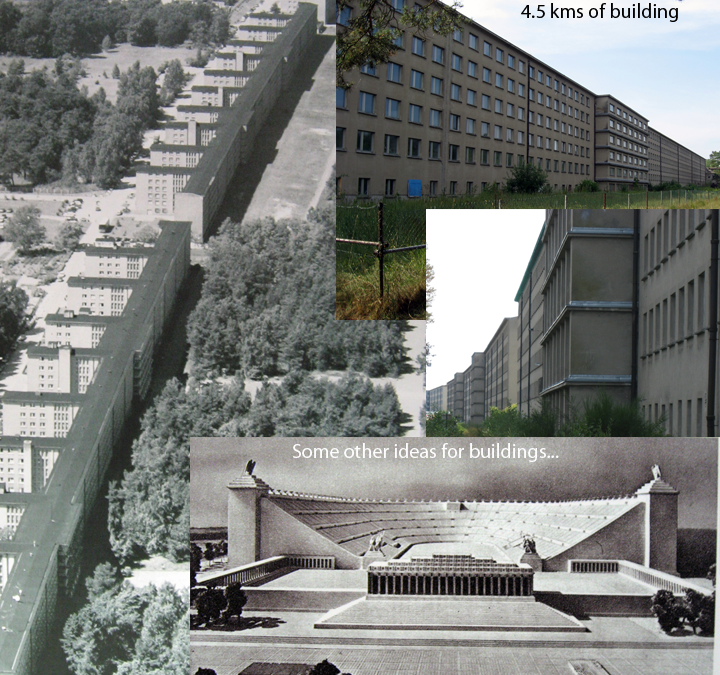 The architect Clemens Klotz was up to the challenge and designed the main 4.5km long building, railway station, garage for 3000 cars, 2 sea-water fed swimming pools (100 x 40 meters), a tower restaurant, theater, festival hall to seat everyone and a huge pier to allow passenger ships to dock. Construction began in 1938 and finished prematurely in 1939 years with the outbreak of the war. The shell of the theater and 8 housing blocks were completed and 6 of them are still standing. There is also an impressive collection of memorabilia and information about the 4 other similar holiday camps that were planned. The camp was sadly plundered during the war and fell in to neglect during DDR times. Several of the blocks have recently been sold to investors, but their plans are still pretty nebulous. A definite highlight of the trip. The next couple of days were spent relaxing and exploring the island – the white cliffs (not a patch on Dover), the dual lighthouses (the 2nd built as the 1st proved to be a bit too short) and long hikes in the forest coming upon follies like the hunting castle with its stupendous staircase and horns everywhere. We also finally managed to get some really good fish, thanks to the now working “Around Me” app – it pointed us to a tiny restaurant just down the road from our hotel with an excellent rating – fresh local fare that rounded off the trip nicely. There was only the drive back, but with such nice memories the trip flew by.